- Atul Nayak, Jason Leigh, Andy Johnson, Paul Morin. New : Using Seismoglyphs to understand seismic data. Traditionally seismologists look at 2D X-Y plots of a timeseries of the displacement of a seismometer in the North-South, East-West and Up-Down directions. The 3D nature of the data is ideal for visualization on the AGAVE, also known as the GeoWall.WiggleView is a program that lets you see the simultaneous recording of three channels of seismic data in response to an event. 1. It is built to run on the GeoWall/AGAVE. This opens up a whole new dimension as the GeoWall is a passive stereoscopic display device and you get to see '3D'. 2. You can playback major events. 3. You can choose how many stations you want to look at at the same time. 4. You can choose to look at the data as 'wiggles' ie. seismograms or as the trace of a particle at the station. 5. You can configure WiggleView to run in monoscopic mode (no stereo) on a laptop or flat projection screen. Currently WiggleView runs on two operating systems : Linux and Windows. WIggleView is based on Immersaview. Immersaview is software developed by the CAVERN group at EVL. It allows you to interact with 3D content on the AGAVE/GeoWall. Immersaview uses Coin3D (Open Inventor toolkit) and glut. 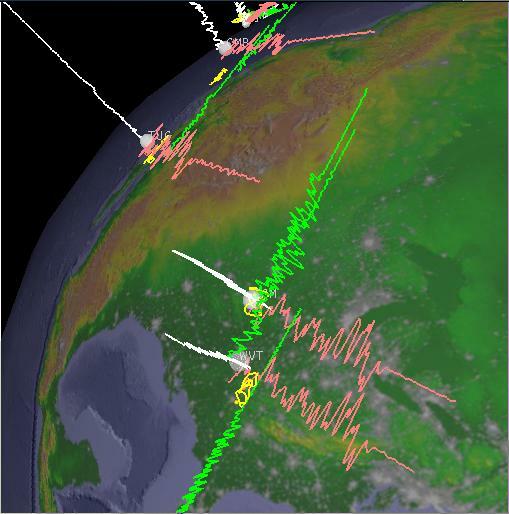 This work has been funded by the Incorporated Research Institutions for Seismology (IRIS).